Violinist Haeun Kim, age thirteen, is a 7th grade student at the Alabama School of Fine Arts, Birmingham, AL. She started learning the violin when she was four years old. Currently, she is studying violin with Cornelia Heard who is a professor at Vanderbilt University, Nashville and Jenny Gregoire who is a professor of the University of Alabama. She is the recipient of Myra Jackson Blair Scholarship (full merit -based scholarship) and this prestigious scholarship is awarded by Blair School of Music, Vanderbilt University. Since age eleven, Haeun has won numerous competitions across the country. At age eleven, she earned 2nd place at the Alabama Federation of Music Clubs competition and was awarded the Young Artist of Exceptional Promise award at the 2012 Eunice Hoffmeister Competition in North Alabama. At the same year, Haeun debuted at Carnegie Hall in New York as a winner of The American Protégé International Competition. At the age of twelve, Haeun made her orchestral debut as a soloist with the Louisiana Philharmonic Orchestra in New Orleans. She also received the first place for the 2012 Samuel Fordis Young Artist Concerto Competition in Georgia, and she soloed with the Georgia Philharmonic Orchestra . In the summer of 2013, she was chosen as a winner of the 2013 Interlochen Concerto Competition and performed as a soloist with the Interlochen Symphony Orchestra in Interlochen, Michigan. In January 2014, she received the second place in the Lois Pickard Music Scholarship Competition in Birmingham. Most recently, Haeun placed first in Alabama Federation of Music Clubs Competition and selected as the Stillman -Kelly Competition representative from Alabama. Over the past summers, she participated in Credo, Arianna Chamber Music Festival, and Interlochen Summer Arts Camp. 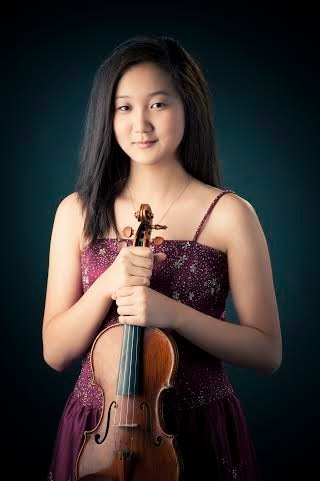 This summer, Haeun will be attending the 2014 Heifetz International Music Institute (six-week program) as the youngest participant and study with Grigory Kalinovsky, Ilya Kaler, and Elmar Oliveira.